Contact Us today to start your future in Truck Driving! Fill out the form below to get the enrollment process started. A training representative will get in touch with you as soon as possible. If accepted, can you provide proof that you are eligible to work in the United States? Can you read and speak the English language sufficiently to converse with the general public, to understand highway traffic signs and signals in the English language, to respond to official inquiries, and to make entries on reports and records? Are you currently on probation or parole? Do you have ANY moving violations or accidents in the last 5 years? Have you been convicted in the last 5 years of Reckless, Negligent, or Careless Driving? Have you EVER been convicted for driving while intoxicated? Have you ever had your driver's license suspended or revoked? Do you have any history of epilepsy, diabetes, or high blood pressure? Do you have any heart or cardiac problems? Have you had any major surgeries, knee or back, or have other limitations? Do you have any history of mental illness? Do you have any history of dyslexia? Do you have a poor work history or lack references? Is there any other information that you would like to share with us about your interest in enrollment? Contact Us to Start Your Career in Truck Driving Today! Call (888) 565-0203 for More Information! Portland, Olympia, Longview, Centralia and Surrounding Areas. 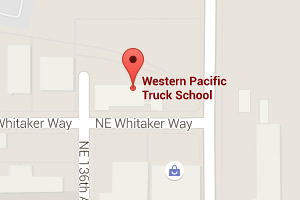 © 2019 Western Pacific Truck School. All Rights Reserved.